As the executive director of KAFM Community Radio, I am excited to announce the installation of our new Palisade Translator at 96.9FM to improve the KAFM signal into the Palisade listening area. We have many supporters and friends in Palisade and we are happy to extend KAFM music and programming to them. We are grateful to all the supporters that made this possible, in particular the Grand Junction Lions Club for their $2500 donation, to FCI for their donation and the many people who made direct donations or who participated in the many 50-50 raffles we did in Palisade this summer to raise money. We are very happy to celebrate the official dedication of the Palisade Translator with a ribbon cutting on November 1st at 4 PM at the Palisade Town Council Chambers, located at 341 West 7th Street and at Palisade Fire Station. We would love to have your presence for this celebration with champagne and light refreshments. For more than 17 years KAFM has served as an essential source of music, culture, and local community information and discussion not otherwise available on FM radio. Every day, KAFM provides free public service announcements and public affairs programming. More than 120 local nonprofit organizations have used KAFM airwaves to talk about their missions, and promote their events. Thanks to the dedication of volunteer programmers, the station offers a wide variety of genres, including jazz, folk, bluegrass, blues, Broadway musicals, big band, Celtic, Americana, and more. There’s something for everyone! We’re getting young people involved with the station in various ways. Kids of all ages learn to record by participating in our “Words” and “Stories” programs. Additionally, both children and adults participate in KAFM’s “Poetry in the Air” feature, a collaboration with the Western Colorado Writers Forum. Local students and the John McConnell Math and Science Center work collaboratively with KAFM to produce the “Ask a Scientist” series. KAFM’s Radio Room offers an affordable venue for live music and other cultural events, organizational meetings and an ongoing gallery exhibit by local artists. While KAFM has a loyal membership that has grown over the years, this important community asset needs to expand its audience. By reaching out to the Palisade area, the Increased coverage will help us grow our membership and make us stronger financially. The total cost of the project was $10,500 and we have only $1500 to go to completely finance this project. 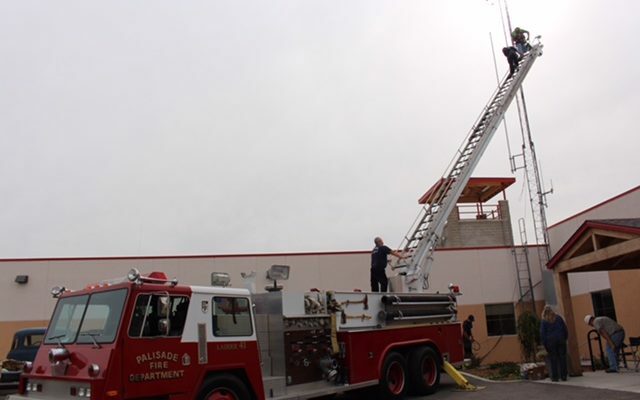 The translator was installed on September 20, this year at the Palisade Fire department with the help of Fire Chief Richard Rupp, the firemen and the use of their ladder truck. The town of Palisade has been wonderful in their support and willingness to help make this project a reality. Currently the signal, 96.9 on your FM dial, is still in testing mode at lower wattage. During our Fall 2016 member drive we will be celebrating Palisade with guests from the Palisade community during a special show on 10/14 at 10 am. A ribbon cutting in Palisade will be scheduled after the completion of our Fall member drive. We are excited to welcome new listeners and members to our KAFM family! Juliann Adams is the Executive Director of the Palisade Chamber of Commerce. Before taking on her current role she was the Director of Sales and Events at Wine Country Inn since opening in 2008. Her background is Graphic Design and Sales and Marketing. She and her husband Dan have a small vineyard in Palisade. They have 4 children and 5 grandchildren. Juliann loves Palisade and wants everyone to experience the community's resources. "Life Tastes good here all year long"
Get The Sunday "Paper" Weekly newsletter from Peach Town News.